Basu’s research focused on determining the properties of the planets’ host star — work that was essential for discerning the characteristics of the orbiting planets. The 46-member, international team, led by astronomers at Harvard and the University of Washington, report their discovery June 21 in Science Express, the early release version of the journal Science. 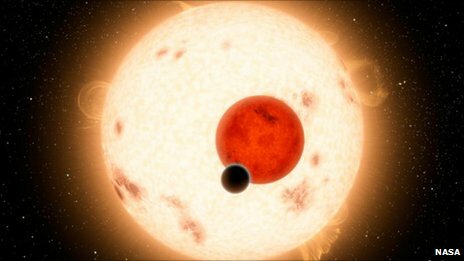 A planet orbiting two suns – the first confirmed alien world of its kind – has been found by Nasa’s Kepler telescope, the US space agency announced. Though there have been hints in the past that planets circling double stars might exist – “circumbinary planets”, as they are known – scientists say this is the first confirmation. It means when the day ends on Kepler-16b, there is a double sunset, they say. Kepler-16b’s two suns are smaller than ours – at 69% and 20% of the mass of our Sun – making the surface temperature an estimated -100 to -150F (-73 to -101C). The planet orbits its two suns every 229 days at a distance of 65m miles (104m km) – about the same distance out as Venus. The Kepler telescope, launched in 2009, is designed to scour our section of the Milky Way for Earth-like planets. “This is really a stunning measurement by Kepler,” said Alan Boss of the Carnegie Institution for Science near Washington DC, a co-author of the study. Kepler finds stars whose light is regularly dimmed when an orbiting planet passes between the star and the telescope. In this case, the team was also able to observe dimming when one star passed in front of the other. 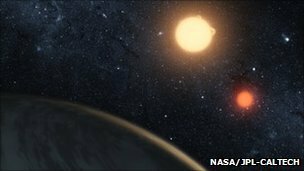 Nasa’s scientists saw additional dips in the light in both stars at alternating but regular times, confirming the dual orbit of the planet. Data collected by the Kepler telescope allows for very precise measurements of the mass, radius and trajectories of all three bodies – the best ever estimates of a extra-solar planet. The finding was reported in Friday’s issue of the journal Science.